Zain Iraq is a subsidiary of the world-famous Zain. To date, the GSM-operator is the largest in Iraq. It has about 14.3 million subscribers, which is nearly 44% of the mobile market. In recent years, there has been a rapid tendency of increasing the number of subscribers of Zain. From this point of view, many people are interested in GSM termination in Iraq via packages of this operator and the selection of the optimal tariff plan to get an income successfully. 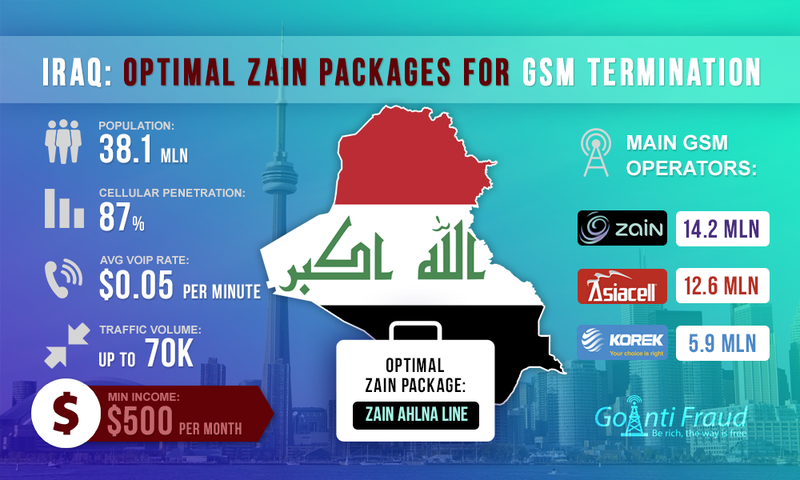 Zain offers subscribers a selection of prepaid twelve packages: Besinoor line (Erbil and Duhok), Zorbasha line, Kolish Zain line, Zain Ahlna Line, Zeyarah line (Visitor's SIM Card) and others. The most appropriate for termination is Zain Ahlna Line. Based on the average rate of $ 0.05 per minute for the country, you will profit $0.025 per minute from this package. Other tariff plans are not suitable for traffic termination as they offer a small number of minutes and high tariffs for on-net calls in relation to the average rate. GSM termination using Topex equipment can bring more profits! Connect your gateways and SIM-banks to GoAntiFraud to prevent the SIM-block, computerize VoIP-systems, and remotely control all Topex gateways and SIM-banks from all over the world. At the same time, the tariffs within Zain Ahlna Line package are valid only in Salah al-Din, Kirkuk, Nineveh, and Diyala. That is why many terminators place multichannel VoIP equipment there. In addition, Zain Ahlna Line involves intensive communication within the network, with no time limits. For this reason, there is always the possibility of terminating traffic for 8-10 hours a day, with certain intervals. If you do so, your profit will be about $400 a month. And if you install a GOIP 16 gateway, your earnings will increase significantly. Terminators may multiply the above amount when they connect to GoAntiFraud. The service allows bypassing a GSM-operator antifraud skillfully. Its working principle is that the GSM termination is carried out using pre-designed patterns to simulate the behavior of the living subscriber in the network. Using the service capabilities, you can extend the lifespan of your SIM-cards and make more money, saving significant time and effort at the same time. Using GoAntiFraud many terminators were able to increase profits in a few times. Do you want to make more money terminating with Topex gateways? Connect your equipment to GoAntiFraud. We can help you customize the logic of termination in accordance with the features of your country, and your business will make you more money!